Cruise the World or Charter Business Awaits. Owner wants the vessell SOLD immediatley !!!! We have been asked to LIQUDATE this asset with all offers seriously being considered by owner. Cash, Trade or Swaps are available by request subject to owners evaluation. This is a once in a lifetime opportnutity for any serious charter owner/operator or just cruising the WORLD in absolute style & comfort having a modern TRAC Stabalising System. This Vessel in Europe/USA would certianly demand 3-4 times her current value. Powered by legendary 2x 6LXB Gardiner engines "Shilo" has a massive cruising range that can take you to New Zealand & Back without re-fueling. Shilo underwent a $1.5M (AUD) refit in 2011 with the vessell having interior, wiring, switchboards & engines upgraded as part of this extensive ovehaul. Interior accommodation sleeps 8 passengers in 4 spacious cabins, including 2 master rooms with ensuites with additional bathroom servicing a fully self contained living area at the rear of the ship which includes, galley/kitchenette & dining room. As you would expect from a capable world cruiser, the navigation, safety and radio equipment is plentiful. Wide decks are a feature, as are the numerous lounge areas provided to ponder on the high seas whilst sipping on a cocktail or your favourite beverage. Covered rear deck includes large dining area, remote pop up TV, quality sound system, ice maker, fridge that encapsulates perfect entertaining area. 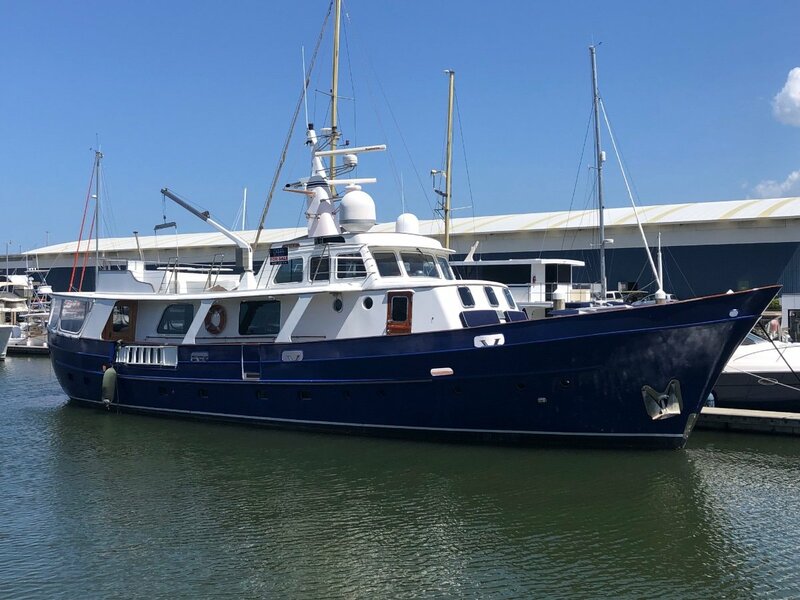 If you are in the market for a vessel with true cruising capabilities and charm to boot, an inspection of this beautiful lady is an absolute must. Recent out of water Survey available by request. Raymarine auto pilot with power steer stick.